Award-winning slip and fall lawyers bringing aggressive representation to clients in Southern California. Top attorneys from a law firm that is honest and will help you navigate the complicated court system. Previous clients frequently refer us, and we have several positive reviews, making us one of the most trusted firms in Orange County. To speak with a lawyer about what is the best option for your slip fall case, contact us today. A slip and fall accident or a trip and fall accident can cause a serious injury that can negatively impact you for life. It can happen anywhere, to anyone; thousands are injured in these accidents every year. When a slip-and-fall injury is caused by another person’s negligence, you’ll need to obtain legal representation from a skilled premises liability attorney with a proven track record. If you’re injured in a slip-and-fall or trip-and-fall accident in Orange County, and a property owner’s irresponsible negligence is the reason for your injury, speak with an experienced Orange County slip and fall injury attorney – Chris Purcell at Purcell Law in Irvine and Santa Ana – immediately. Although a cut or scrape may not seem serious, other injuries such as spinal cord damage or concussions could have lifelong consequences. Spinal cord injuries could even result in paralysis or death, so clearly, slip and fall accidents are nothing to take lightly. HOW LONG DO YOU HAVE TO FILE A PERSONAL INJURY CLAIM IN CALIFORNIA AFTER A SLIP AND FALL? If you or a loved one has been injured in a slip and fall accident, contact an experienced attorney as soon as possible. Victims only have two years from the date of the accident to file a claim against the property owner, so you must move quickly if you want to receive compensation for your injuries. The defendant owned, leased, occupied or controlled the property at the time of the injury. The plaintiff was injured as a result of the slip and fall accident. The injury occurred because of the defendant’s negligence. HOW CAN ORANGE COUNTY ATTORNEYS PROVE NEGLIGENCE IN A SLIP AND FALL ACCIDENT? 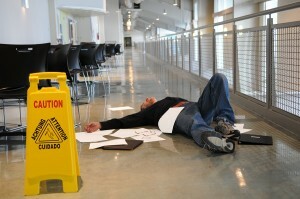 It’s essential that you prove negligence in order to be awarded compensation after your slip and fall accident. If possible, try to take pictures of the area after you have fallen or collect any evidence that proves what caused your fall. If there were any witnesses present at the time of the fall, be sure to get their contact information and write down what they saw before they leave the scene and their memory becomes foggy. Ask the store owner whether there are surveillance cameras pointed in the direction of where you fell so you can show exactly what happened. Always seek medical attention after you have fallen, even if you do not think you have any injuries. You may not experience any symptoms for some injuries, such as a concussion, so even though you think you’re fine right after the accident, hours later, you may realize you need medical attention. That’s why it’s always best to get treated right away so you have documentation of your injuries. If you can prove the property owner should be held liable for your injury, you may receive various types of damages, including compensation for your current and future medical expenses, lost wages, lost earning capacity and pain and suffering. The amount you will receive will depend heavily on the circumstances of your case and the injury you suffered after the slip and fall accident. If you have been injured in a slip and fall accident, don’t hesitate to contact a lawyer as soon as possible. The premises liability law is complex, so you will need the help of an experienced attorney in order to receive the compensation you deserve. Contact Chris Purcell today to schedule a free case evaluation. Chris Purcell has aggressively represented personal injury victims in Orange County for more than twenty years. He has the record, experience, tenacity, and passion it takes to represent you effectively. Chris will thoroughly investigate your accident and injury, compile the evidence, and fight aggressively on your behalf. He is not reticent to take on big corporations and the big insurance companies. If an agreeable out-of-court settlement is not offered in negotiations, Chris will take your case before a judge and jury, and he will make sure that your story is clearly told and fully understood. If you’ve been seriously hurt in a slip-and-fall accident or a trip-and-fall accident, your medical, financial, and emotional challenges may seem overwhelming. Chris Purcell is committed to helping you get your life back on track after a serious injury and helping you move forward in the most positive and constructive way possible. Chris represents clients throughout Orange County including Irvine, Anaheim, San Clemente, Santa Ana, and San Juan Capistrano. He has experience representing people in cases involving motorcycle accidents, truck accidents, bicycle accidents, pedestrian accidents, premises liability, product liability, dog bites, and construction accidents. All premises liability claims are handled on a contingency fee basis, so you pay no fees unless and until Purcell Law recovers compensation for you. To schedule a free consultation with an Orange County slip and fall injury lawyer, call 714-884-3006 or contact Chris by email today.